La Jolla, CA, USA March 5, 2013 — MadCap Software, Inc. the leader in multi-channel content authoring and a showcase company for Microsoft (NASDAQ: MSFT) Visual Studio and Microsoft XPS, today announced the launch of MadCap Flare 9.0. Flare is the industry’s leading technical authoring application for publishing online Help, knowledge bases, policy and procedure manuals, user guides, and other forms of content. Only MadCap Flare lets authors create a single project and then directly publish it in multiple formats optimized for the Web, mobile devices, desktops, and print publishing—without the need for any additional tools. New with Flare 9.0 is a documentation-centric social collaboration platform that enables users to connect, collaborate, and share knowledge with fellow authors, employees, and customers. MadCap Pulse, a new server-based plug-in to Flare, allows published online documentation to contain functions much like those of many social media websites on the Internet. Microsoft Office 365 support—enabling authors to import and export Microsoft Word content without installing the Word software. Adobe FrameMaker 11 support—allowing the import of content from the latest release of Adobe’s software. 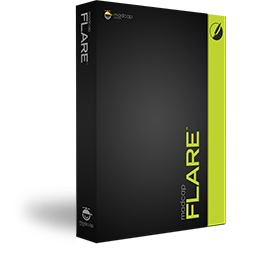 Flare 9.0 also enhances the import capabilities of earlier FrameMaker versions and Adobe RoboHelp. Free MadCap Capture integration—giving users the ability to download Capture at no cost and take full advantage of its image capture and graphics editing capabilities with Flare. Accessibility enhancements—supporting Section 508 compliance; new functions include the ability to add empty ALT text for images and a warning for images when ALT tags cannot be read. Secure File Transfer Protocol (SFTP) support—offering users the option to publish projects using the SFTP protocol, the secure option to the older File Transfer Protocol (FTP).